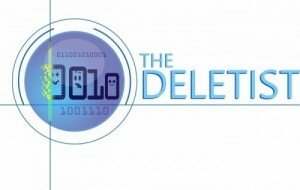 The Deletist – Be elite and delete. Save strategically! After leaving the Tectonic Plates, we finally enjoyed slices of the geothermal-baked bread, slathered with slabs of fresh Icelandic butter. The bread was dense with a slighty sweet flavor to it. 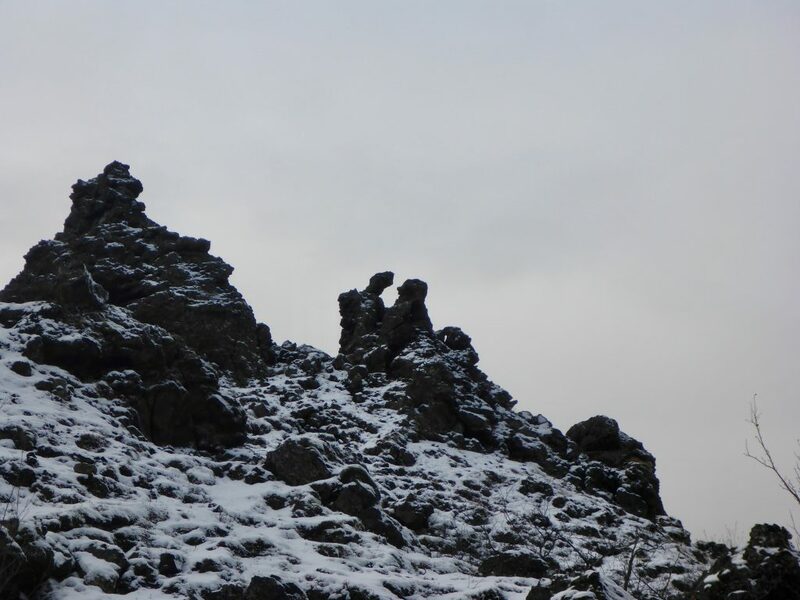 Fortified, we headed out to trek through Dimmuborgir, loosely translated as the Dark City. A mass of oddly shaped lava formations towered high above the trail. As we descended into the Dark City, we were told to be on the lookout for elves, huldúfolk (hidden people), and trolls. Snow covered many of the rising structures which only enhanced the shapes and shadows. Faces, figures, animals, and other familiar shapes appeared before us with each turn we took, further into the Dark City. Our imaginations ran wild. I could’ve stayed all day in Dimmuborgir exploring, but sadly we only got an hour to look around. 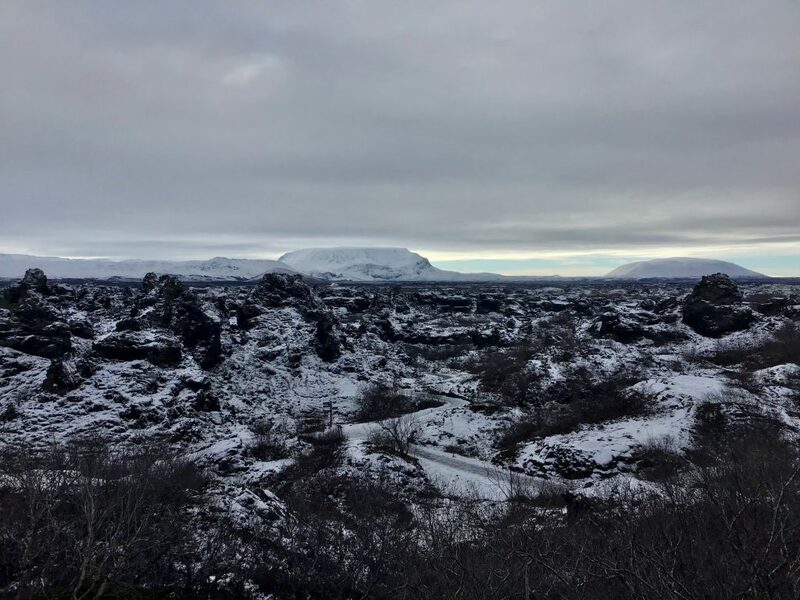 Following Dimmuborgir, we headed to another other-worldly site on Iceland, pseudo-craters. The only places one can find pseudo-craters are Iceland, Hawaii, and Mars! Pseudo-craters are formed when water gets trapped beneath lava and creates a crater-like structure from the steam and pressure building up. A panorama vista of a lake appeared showcasing deep indentations in the earth blanketed in grass and mosses. In certain places, fuzzy white sheep dotted landscape. Most of them were happy to graze as we traipsed by taking our pictures. It had already been a full day, filled with marvels, but one stop remained on the way back, the majestic Goðafoss, or Waterfall of the Gods. 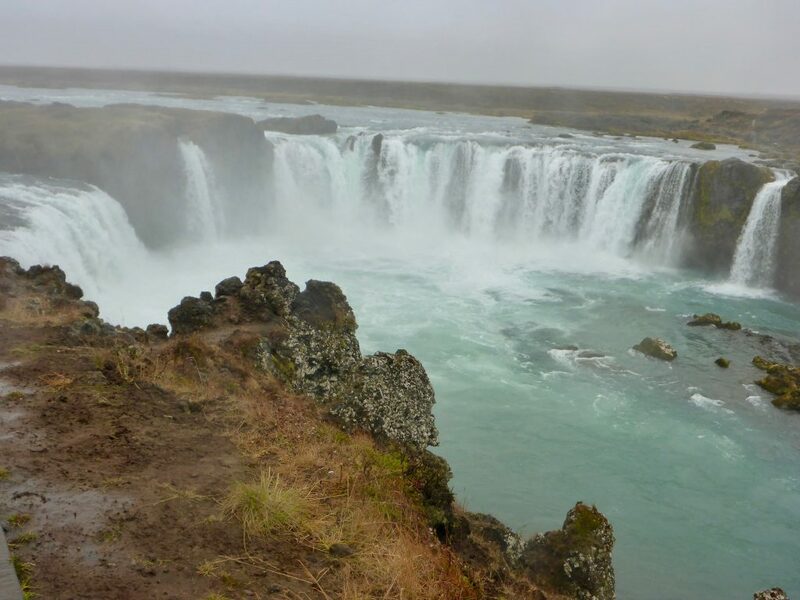 The waterfall was given the name around 1000 A.D. Bending under pressure to convert to Christianity, the community leader at the time threw symbols of the pagan gods the Icelandic people were worshipping into the waterfall. This was to symbolize their intent to start following the new religion. After a full day, we returned to the hotel, freshened up and got ready for a home-hosted meal prepared by a local Icelandic family in Akureyri. Along with a delicious meal, we got to chat with our hosts and learn about Iceland from a resident’s perspective. The following day we headed out early for a whale watching tour and fishing. Stay tuned! Read more about the trip to Iceland here. Often when I get overwhelmed with clutter, my first line of defense is a piling system. To clarify, my definition of a “piling system” means that I organize my things contextually, or based on function (i.e., what they are doing), rather than putting things that look the same all together. Some years ago I started using an old shoe box to aggregate all the items I wanted quick access to for decorating and repairing my apartment. The box contains a hammer, screwdriver, exacto knives, three different kinds of tape (electrical, duct, and painter’s), tape measurer and a box of hooks and nails for hanging things on the wall, among other things. It may not seem like these things go “together” because I have wall paper/fabric samples, exacto knives, different kinds of tape and some tools. If you went to a hardware store you would likely find all of these things in their own aisle. However, for my purposes it made perfect sense to “pile” them together. Usually when I’m fixing something around the house, I need more than one of the things in my quick access box. Before I created the pile I spent a lot of time locating each item. 2. I was using these things constantly and it was taking too much time to put everything away, wherever it was being stashed at the moment, and then retrieve it again. Consequently, things were left in random places resulting in time wasted to find them. Having the quick access box made it easy to find the things I needed instantly and put them away when I was finished. Other times with paperwork, electronic documents or emails, I create piles (or folders) based on actions. For example, I set up folders in all of my email addresses to collect tax-related documents. Then when I’m ready to list my expenses, or assemble my documents, they’re easy to locate. I have a similar system set up on my computer to manage tax-related documents. As a small business owner, and someone who has to file cross-border taxes, it amounts to a lot of paperwork! The piles may not look neat, but I know where everything is. Finding things and putting them away is quick and effortless. Everywhere I turn it seems more and more people are using things like watches, fit bits, and other devices to help them with self-monitoring. Devices and apps that prompt us when to breathe deeply or stretch to reduce stress levels. Apps that monitor how much sleep we get each night and the quality of it. For women, there are apps to monitor menstrual cycles and ovulation or to help plan for egg freezing. I remember speaking to one woman who said her app knew when she was getting her period before she did. Several days before her cycle began, she would start receiving ads for products. Maybe some of you are reading this and thinking such a reminder might actually be kind of useful. But there are bigger things to consider. In order for those ads to be sent means that your personal health information about your monthly cycle is being shared with corporations. Last month I was listening to a webinar on “The Legal Implications of Collecting Data” by Montaña & Associates. I was horrified to learn that certain apps used to monitor heart rate information were automatically transmitting the collected data to Facebook! Without the user’s consent or knowledge that this was happening! The data was being transmitted to Facebook even when the user wasn’t on Facebook. I think many of these tracking apps can be amazing and really useful. I’ve tracked a lot of these kinds of things manually but I’m sure it could be a lot more precise with technology. However, I’m terrified to use them specifically because I’m nervous about the privacy implications. I don’t want corporations or Facebook knowing how many hours of sleep I got, when my period is coming, or my average heart rate. I don’t feel this way because I’m trying to hide something or because I feel like I’m doing something wrong. I feel this way because these are private and personal things about me. I can’t help but think that if we turned off our devices more often, we probably wouldn’t need to rely on them for things like self-care and tracking. The irony of using self-care apps to get back what we gave away, or lost, by using our devices so much in the first place. What’s wrong with paying attention to our own body to monitor it? As a tweenager I started learning a foreign language. At my school in fifth grade, we studied Spanish for half a year and French for half a year. Then we got to pick which language we wanted to study for the next three years. This felt like a big decision in my life at the time. I picked French mostly because I was weirded out by the upside down punctuation marks in Spanish. Learning a foreign language was tough! I remember my mouth struggling to form new sounds. My ears working hard to make sense out of an unintelligible string of babble, trying to discern patterns and identify words I had just learned. Even at the tender age of 11 with a young, spongy brain, I complained mightily about it to my father. Stamping my foot and chastising him for not teaching me a foreign language when I was younger and therefore could have picked it up effortlessly. My father laughed and said that he had raised me bilingual, in English and mathematics. I didn’t find this comforting at the time, but now I realize math is a language. It was true, he had raised me with math as a “second language.” I’m fluent in reading numbers and not at all scared of equations. One of the first songs I learned was the “addition song” where we would add 1+1, 2+2, 4+4, etc. to a memorable tune not giving up until we reached 4-digit numbers. The more I learned about the world around me I realized that I was fluent in a couple of life languages. In addition to math, I would also consider I’m fluent in music. In first grade I learned songs with solfieggio, a method of assigning hand gestures and names to notes. With practice I also learned how to read sheet music, rhythms, and other symbols used to indicate articulations, speeds, and dynamics. As a bassoonist, I’m fluent in two clefs, bass and tenor. Excerpt of the Bassoon 1 part from the first movement of Beethoven Symphony No. 6, Op. 68. My part switches between bass clef and tenor clef (looks kind of like a “B”). As I thought about these life languages, I wondered what other ones are out there that other people might be fluent in such as reading body language or facial expressions, dance movements, or actors who specialize in improv. I did eventually become fluent in French, though I’m not anymore. Two years ago I got over my weird aversion to the upside down punctuation in Spanish and started taking courses. ¡I love it! 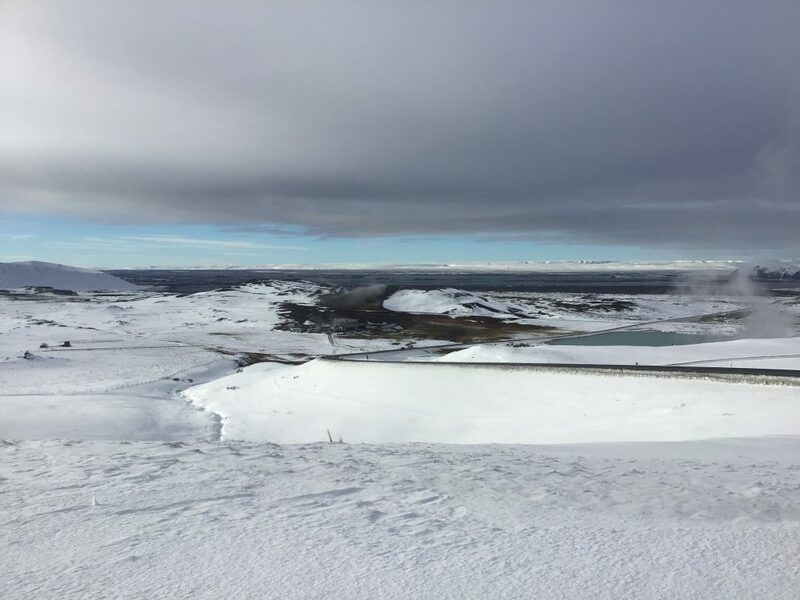 Our first day in Akureyri started with a bus ride to Myvatn, an area with a lake surrounded by geothermal activity. We learned about the area in the visitor centre. After we met a local bread maker who cooked the dough in geothermal hot pockets, rather than using an oven! Containers of bread dough are placed in crates and then lowered into holes. The holes are covered and the dough is left to cook in naturally-generated heat. Later that day we tasted the bread. It was rich, brown bread, a bit sweet and extra delicious when smeared with Icelandic butter. 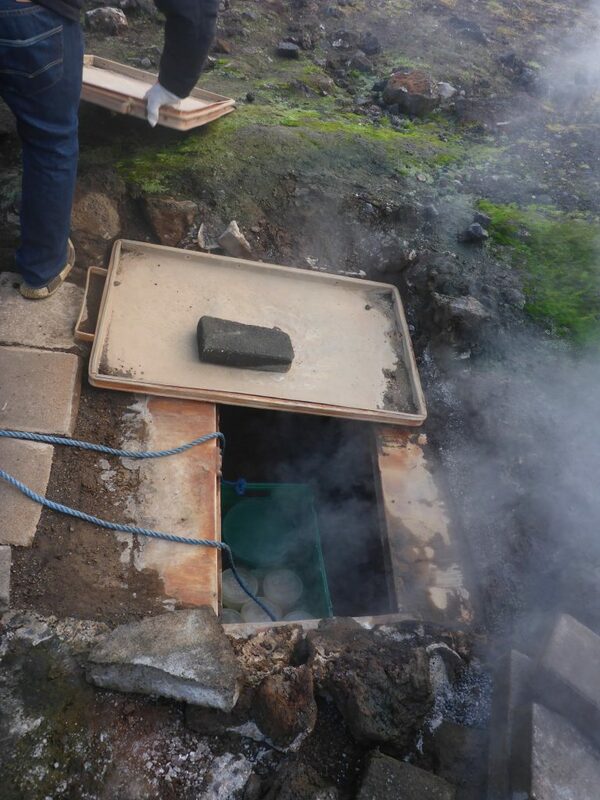 After the bread maker, we went to Hverir, a geothermal spot. The bus ride was short, but it felt like we had been transported to another world. A reddish, muddy landscape spread out before us in stark contrast to the snow covered hills surrounding the area. The air was hazy with pungent, sulphur-scented smoke. 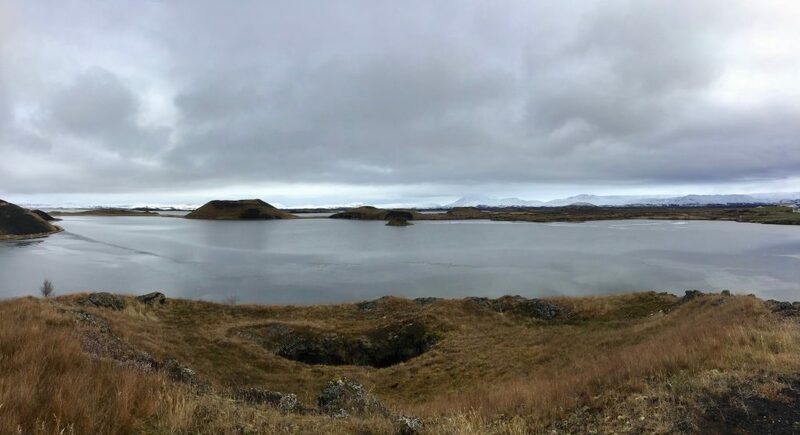 The Hverir landscape. Boiling hot and enshrouded in smoke. We were given special booties to cover our shoes and protect them from the soft, viscous mud. While tromping through a particularly muddy patch, the suction of it pulled off my booty. Needless to say, my shoes didn’t stay clean. erp. 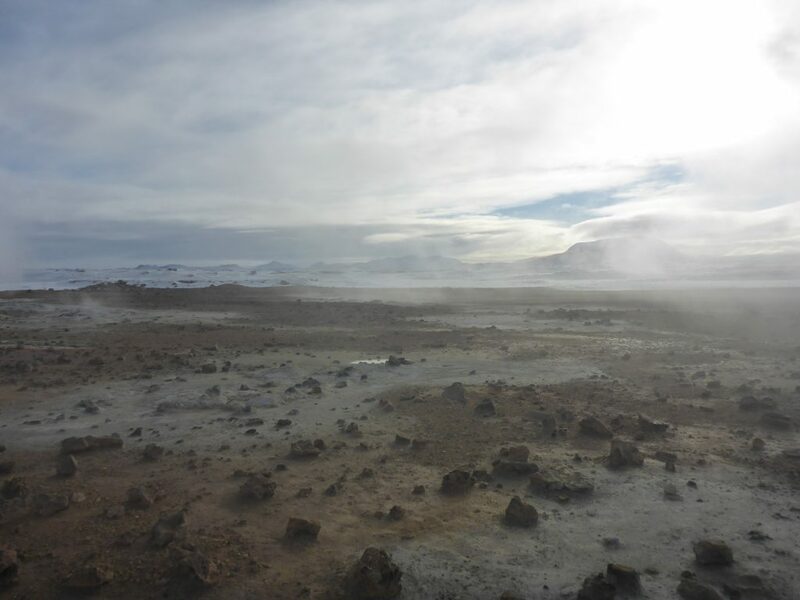 Despite the snow surrounding us, Hverir was boiling hot, literally! Some of the mud holes were bubbling. We were cautioned to stay on the trails. The ground and mud were hot enough to get a severe burn. After Hverir, we stopped at another scenic view point. It was a cold, crisp day and most of the land was covered with a soft dusting of fresh, white snow. Having lived in cities for most of my life, it’s always a treat to see unspoiled landscape stretched out before me. 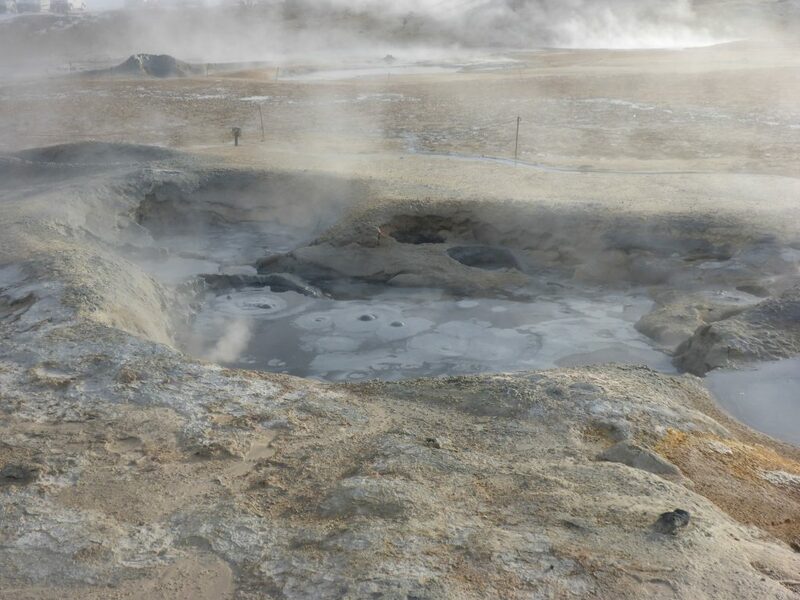 Even from a distance you can see the steam of the geothermal hotspots dotting the area. After we visited one of two spots in Iceland where you can see two tectonic plates touching each other. In the other spot, which we visited a few days later, the plates are 6km apart. But in this spot, the plates were almost touching and we could stand with one foot on each plate. 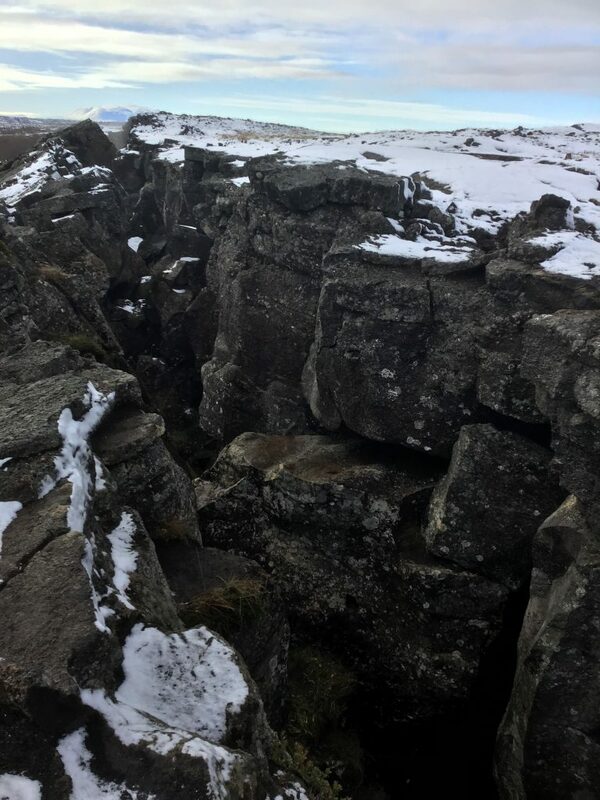 It might just look like another craggy rock crevice, but these are tectonic plates. Most people are surprised to learn that I’m not a neat freak. I’m actually a little bit messy. My goal is to be as efficient as possible. Doing something efficiently is not always the fastest way to accomplish a task, but it is the most complete. This means I spend less time and effort on redoing things. While studying business process management I learned that reworks, basically having to do the same thing twice because of mistakes, takes at least twice as long as doing it correctly the first time. Who has time for that? Sometimes being organized takes too much time and it slows me down. For example, I place all my kitchen utensils in a couple of buckets. I don’t separate the large spoons from the spatulas and can opener. I’m always trying to be balanced about this – organized enough that I can find what I need when I need it, but not to the point it would slow me down to put something in its proper place. #1: Have less stuff. Maintain only what I need, basically one of everything and purge regularly. With less stuff to worry about crowding up drawers and closet spaces, it’s a lot easier to throw things in and find them quickly later. Then when I go to put stuff away (see #2), I just throw it in. I don’t take time to organize it. My bookshelf is loosely arranged by size and type (fiction, professional, photo albums, and cookbooks). But beyond that I just throw them on the shelves wherever there is space. However, I only have 4 small shelves of books so it doesn’t take me that long to find something. All my kitchen utensils live together, but I also only have one of everything I need making it easier to locate something. #2: Have a “home” for everything. This means dedicating a space to store items. One of my favorite places to create is a “use me first” spot. This method works well in places like the fridge and bathroom where products/groceries tend to expire.